‘Geburtstag’ is German for ‘Birthday’ which makes GeburtstagsChecker an application that checks for upcoming birthdays and reminds you of them to avoid potential embarrassment if your memory is rather weak. In doing this, GeburtstagsChecker aims to be both customisable and easy to use. It allows you to import birthday information and the display of upcoming birthdays is highly customisable, allowing you to decide which of the information (e.g. birthdate, age, days until birthday etc.) you want to see and how it should be displayed. 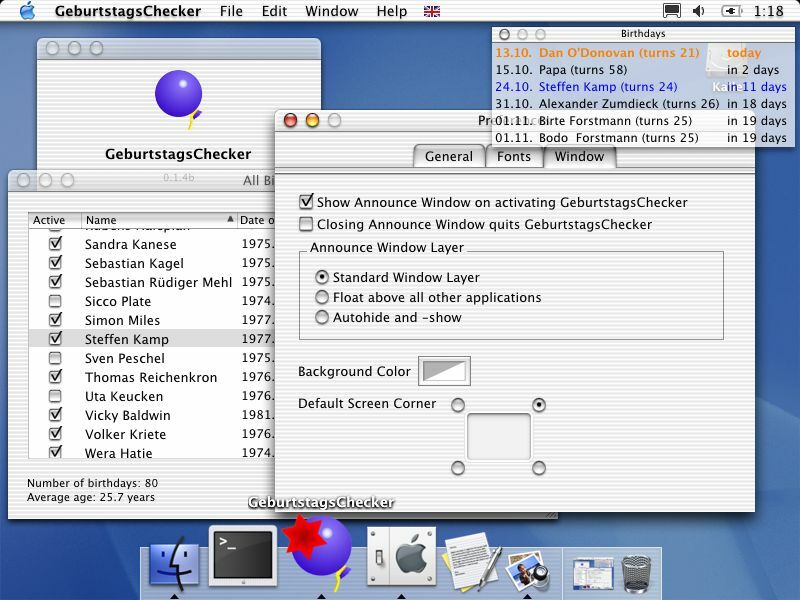 GeburtstagsChecker was designed to interfere as little as possible with the daily use of your Macintosh. After you’ve taken notice of the information GeburtstagsChecker’s window can be dismissed with just one click of your mouse. The program can be made quit automatically after this but it is equally suitable to run permanently in the background and catch your attention whenever new birthdays approach. 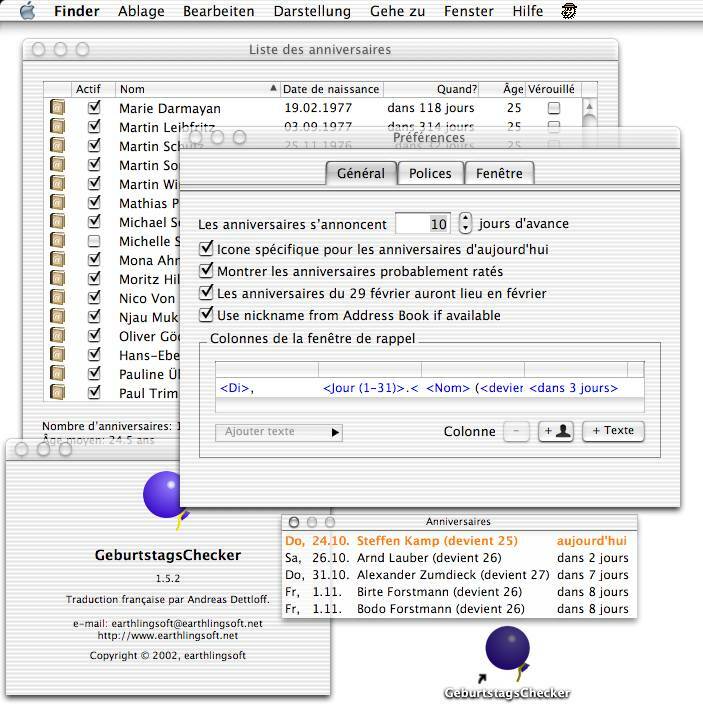 But GeburtstagsChecker is more than just a birthday reminder: Of course, it can be used for other annual events such as anniversaries, public holidays etc. as well. In addition to the English version, GeburtstagsChecker is also available in German, Spanish and Japanese. We appreciate your feedback. 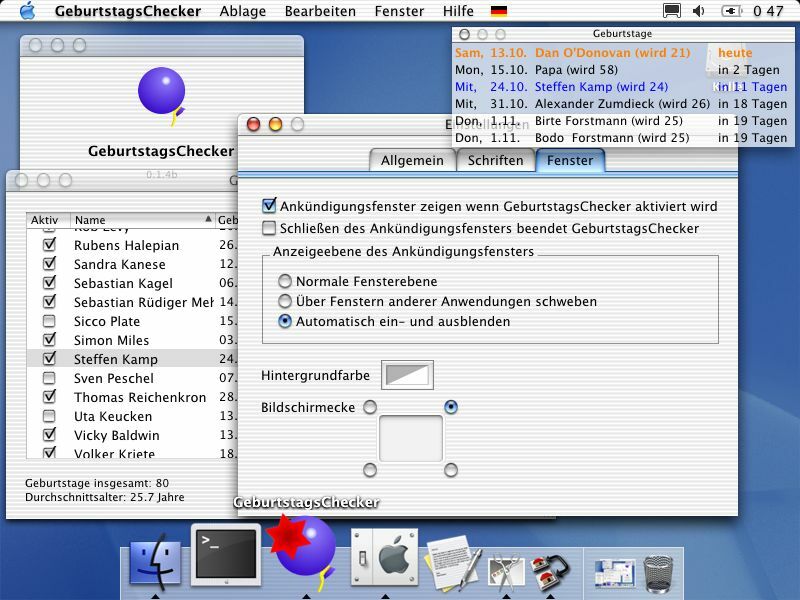 An old version of GeburtstagsChecker that runs on the classical Mac OS is still available on our old stuff page. In some cases the age of persons was not displayed correctly. This has been fixed. Anniversaries did not work on Mac OS X 10.4. This has been fixed. 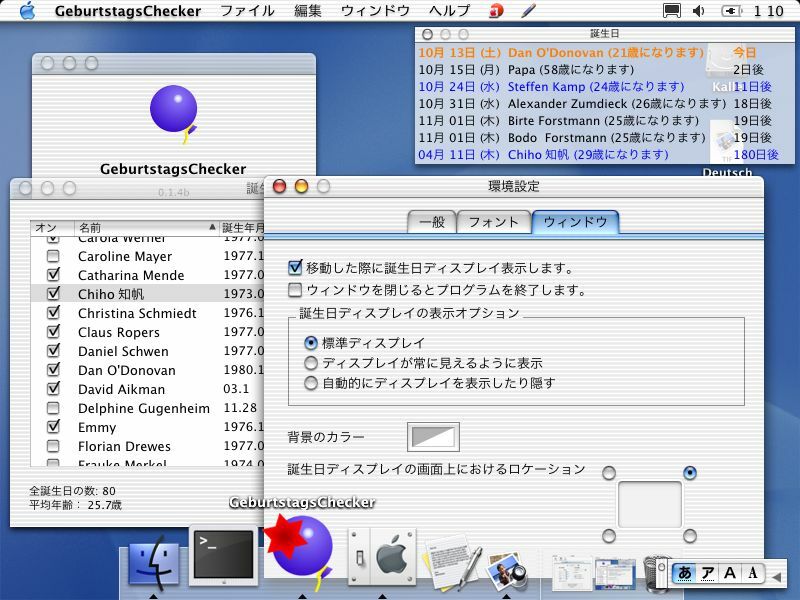 Date designations such as “today” were not localised on Mac OS X 10.5. This has been fixed. Checking for GeburtstagsChecker updates is now done using Sparkle by Andy Matuschak. You can choose to automatically check for updates at each startup of GeburtstagsChecker in the Preferences dialog.